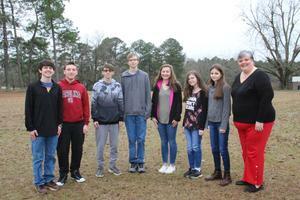 Seven students at B-L High School earned perfect scores on one of their end-of-course exams for the first semester. Congratulations to Rachel Connelly, Ethan Davis, Merewyn Durst, Amber Motley, Nathan Parker, William Taylor and Landon Truitt. All of these students are in the ninth grade at BLHS. End-of-course exams are taken in the subjects of English I and Algebra I (9th grade), Biology I (9th or 10th grade) and US History (11th grade). All of the students mentioned above earned their score of 100 on their Biology I exam. The only exception was Merewyn Durst, who earned her perfect score in Algebra I.